Well, it turns out an entire leaf was missing all due to one dropped stitch. I ripped the border back to that spot and then laddered down to where I knew, or at least kind of thought, I had all the correct stitches and some sort of idea of how to fix the problem. 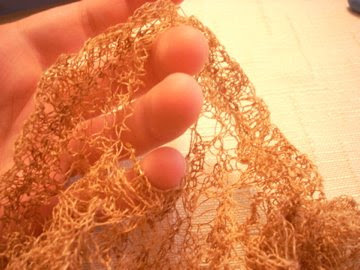 I don't have any dropped stitches anymore, but it still looks like there's a giant hole in the lace. Everything is way too loose, especially up by the needle where there are supposed to be four rows of garter stitch. Any ideas as to why this is? I haven't a clue. I did some spinning therapy yesterday. Aren't those colors pretty? I also swatched for a sweater. I need to move up a needle size. More on that if this shawl every gets finished. Thanks everyone for your kind words and suggestions and sympathy! I had a bit of a panic. That has happened to me in the (recent) past. I think you loosen everything up with the dropping down and things stay loose after you have worked your way up. Things should sort themselves out during the blocking. Yeah, like they said. It should be fine...unless you're really missing TWO leaves?!? Haha. Just kidding. The hard part is over. Phew! Impressive composure. Seems the worst is over, the part that required the brass knuckles. Huh? Well, you know what I mean. 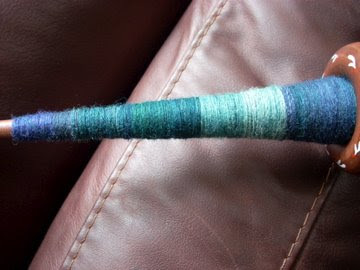 Wonderful happy colors from your spinning! Smooths over the bumps in the road. 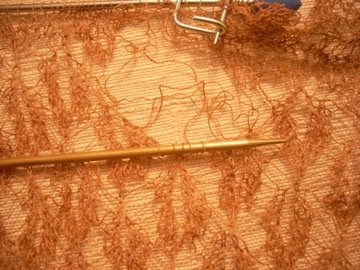 If your yarn overs are too loose, you can fiddle with the tension of each stitch after the knitting is all done and secure again. 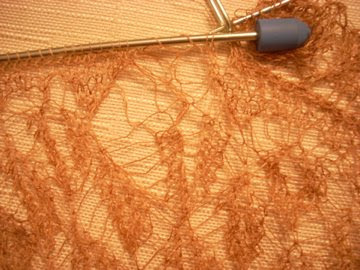 I had a REALLY bad snag on my shawl, but if you go slowly and follow the stitch backwards you can re-tension the piece. 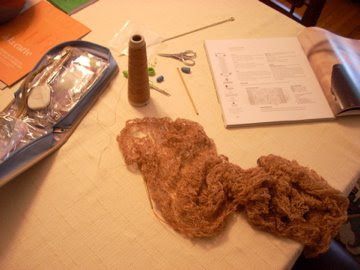 If you can't figure it out your lys owner should be able to show you. You don't have to wait till after blocking to do it, in fact, I would finish the knitting, then re-tension the problem areas, then block. 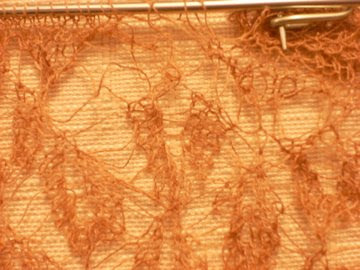 omg I didn't know what to say about that hole - in the pictures in the last post, it looks like the yarn was actually broken! Hmm..I agree - step 2 needs some alcohol or chocolate or something. That whole event would have been enough to give me heart palpatations. 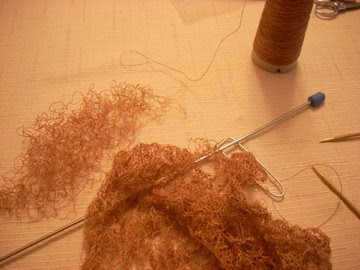 Sorry that I have little to no lace knitting experience and cannot lend a hand in the repairs. It looks as though things are turning around a bit though... Good luck!! Oh, btw, your spinning is beautiful, as usual!! I know it's not the same but you can fix it! One way or another!